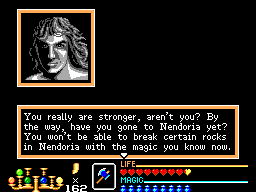 Before going to Nendoria, it's important that you have both the Earth and Thunder raised to level 2. 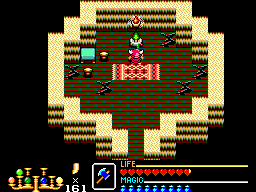 Note that you'll need 100 horns for the Earth Magic. First, let's get the Thunder Magic upgraded. Go back to Gilius place at [7,14] and talk him. He'll tell you some more blah-blah you probably don't want to hear and that's it. 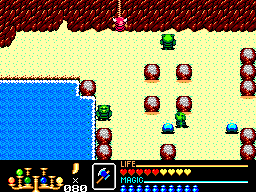 Your Thunder Magic is now more powerful and consumes as little magic as before. Not done yet. 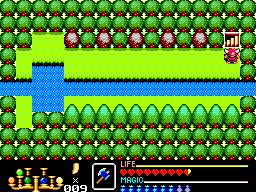 Before paying Battler a visit, now that you have the Canoe, follow the river to the left. Cut the tree and climb down the stairs. 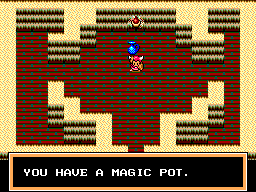 Talk to the old man in the room and he'll make you carry 1 more magic pot. Finally, to make all the walking all the way here worth, go to the mountain where you first found Battler and talk to him. He'll offer to teach you a more powerful version of the Earth Magic for 100 horns. Select &apos;yes&apos; and that's it. You can go back to the 5th Labyrinth and go to Nendoria.